Artstone - Ready for use, Artstone features versatile, classic styling and lasting beauty for retaining walls at your home or business. Versa-Lok - Versa-lok systems are the original solid, pinned segmental retaining walls. Quick and easy to install, Versa-lok retaining walls offer superior durability and a wealth of design/build options along with a variety of styles and sizes. Pyzique - Stone is a "one" stone system. Each trapezoidal-shaped Pyzique Stone has two faces allowing may projects beyond retaining walls to be built. 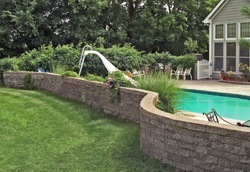 The Pyzique stone builds straight and curves retaining walls, shadow box walls, bump-out walls, steps, patio barrier walls, BBQ grills, outdoor kitchens, stone fence, lawn and paver edge, and much more. Belgard - Belgard manufactures an elegant collection of interlocking pavers and retaining walls for all your exterior landscaping projects. All Belgard products have a long history of successful applications on thousands of residential and commercial projects. Amcor - A nationwide network of oldcastle manufacturing facilities has produced Architectural Masonry and Concrete aggregate products. These products include the traditional and antiqued paver and wall series, concrete block, stone and brick. Lehi Block - Lehi block enjoys a large market in architectural landscaping products for outdoor retaining walls and other landscaping projects. 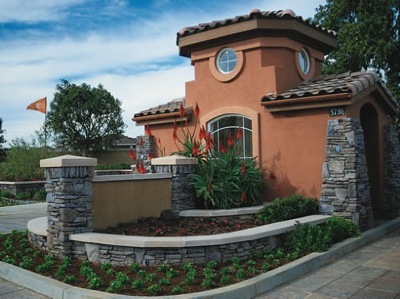 Do-it-yourself projects such as landscaping wall are simplified by using Artstone Block. - With the award winning DekBrands Floating Foundation Deck system, adding a deck to your home has never been easier. The Floating Foundation Deck System has revolutionized deck construction. The system is easy to use, allows a variety of customized applications for decks. Belgard Pavers - Belgard has produced interlocking paves, paving stones, and garden wall products. 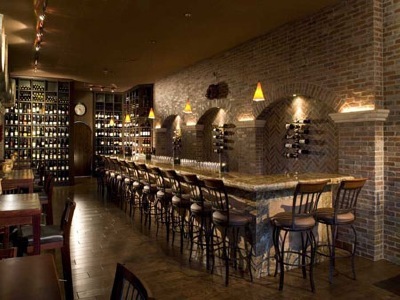 These products include the traditional and antiqued paver and wall series. All Belgard products have a long history of successful applications on thousands of residential and commercial projects. Pavestone - Pavestone is dedicated to the production of the concrete pave stone units, our business principle is to be driven not only by technology in manufacturing, but also in the development of segmental paving systems. Interstate Brick - Interstate brick offers an array of colors, exceptional quality, and lightweight of the clays found in the company's extensive deposits produce distinct products. Interpace Brick - Interpace Brick has been producing face brick and paving for over 100 years and continues as one of only a few independently owned and operated brick plants in the country. Robinson Brick - Robinson brick has been a leading manufacturer of the most beautiful and highest quality brick products. Intersate Brick - Interstate brick offers an array of colors, exceptional quality, and lightweight of the clays found in the company's extensive deposits produce distinct products. Interpace Brick - Interpace Brick has been producting face brick and paving for over 100 years and continues as one of only a few independently owned and operated brick plants in the country. 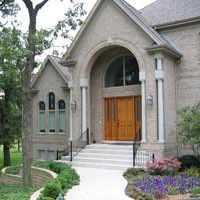 Cultured Stone - Cultured Stone product line offers hundreds of pre-cast stone veneers and architectural trim products. 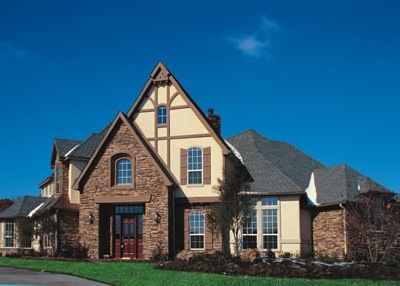 Cultured Stone brand is the most preferred by architects and builders. Harristone - A lightweight, all-masonry pre-cast stone veneer ideal for new or exiting homes and commercial buildings in both interior and exterior applications. Harristone delivers the authentic look and feel of natural stone without the expensive price tag. 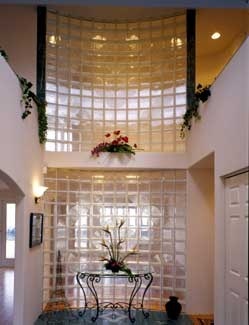 The stone installs quickly and easily, which makes it perfect for professionals and do-it-yourselfers. Whether its windows in your living room or a Glass Block Shower System in the bathroom, Pittsburgh Corning products add a new level of design, class, style and security to any room in your home. 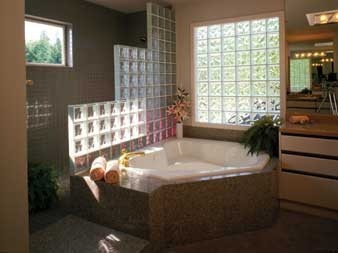 maintenance of a Glass Block Shower System.